I’m an herb collector. My pantry shelves are lined with jars of everything from butcher’s broom and witch hazel to marshmallow root and violet leaf. I buy them in bulk, arguably compulsively. I burn them, drink them, cook with them, bathe in them. I write quick poems & prayers with them. 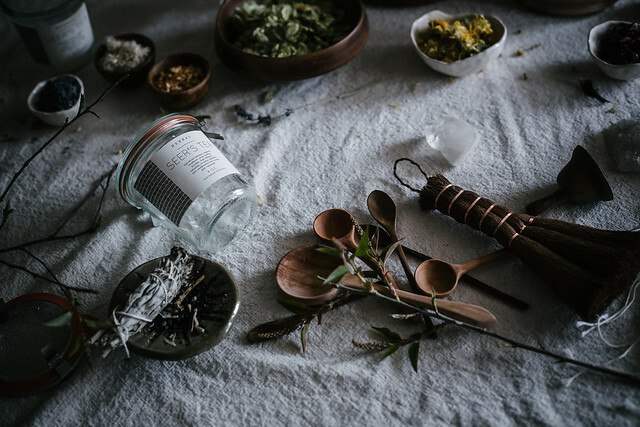 I give them as gifts—as teas, salts, and infusions—packed in amber bottles, weck jars, and muslin bags. 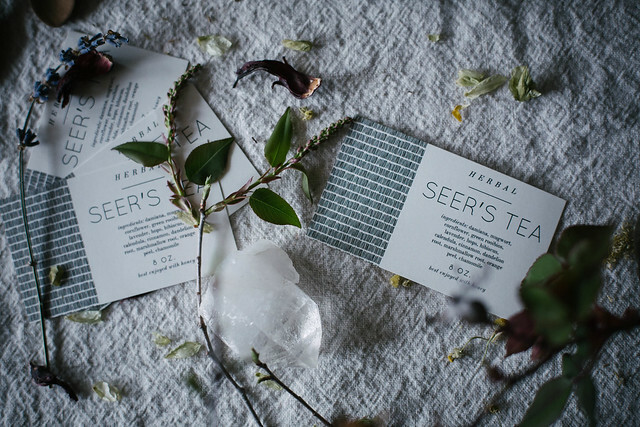 And I’ve teamed up with Makr, a new design app for the iPad, to create beautiful labels for my herbal creations! I’m a woman obsessed. When I downloaded the app I spent the whole day designing labels for everything (caramel, pesto, jam, pickles…), menus, place cards, recipes cards, and gift cards & tags. You can even import your own photographs, drawings, and logos. And then they’ll professionally print them for you & send them in the post. Or you can print them at home. It’s basically the best thing ever for creatives that don’t happen to be graphic designers. If it’s a printed thing, you can make it. On Makr. Hence the name. Makr is generously offering a special for Local Milk readers—you can enjoy a free Makr credit and 20% off a print order! Just register with the code LOCMILKFAN and enter the same code at checkout. You can download the Makr app here—and you can check out my project that you see here and customize it to make it your own! So get thee to tea blending & designing! 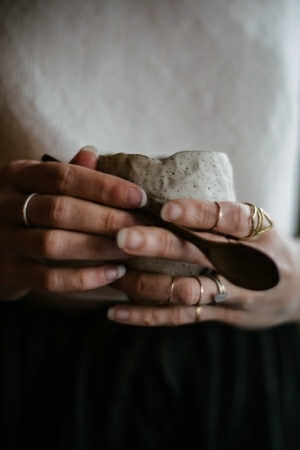 In celebration of making and friends far & near, I’ve created a little virtual tea party here. The recipe for the seer’s tea blend & muffins can both be found after the jump! 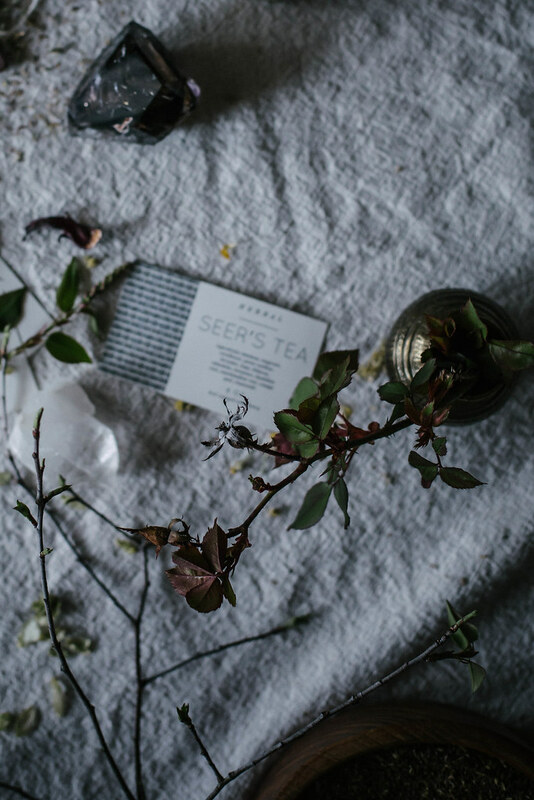 I designed this label for a potent herbal blend intended to relax & open the mind. I crafted it to send to some long distance friends. The internet is like that—you find yourself dear friends with people you’ve never seen in the flesh. So what is there to do but mail a package, a small physical interaction in this digital world? If everyone lived near by, I’d have a proper tea party. Well, proper my way. Which is largely improper. 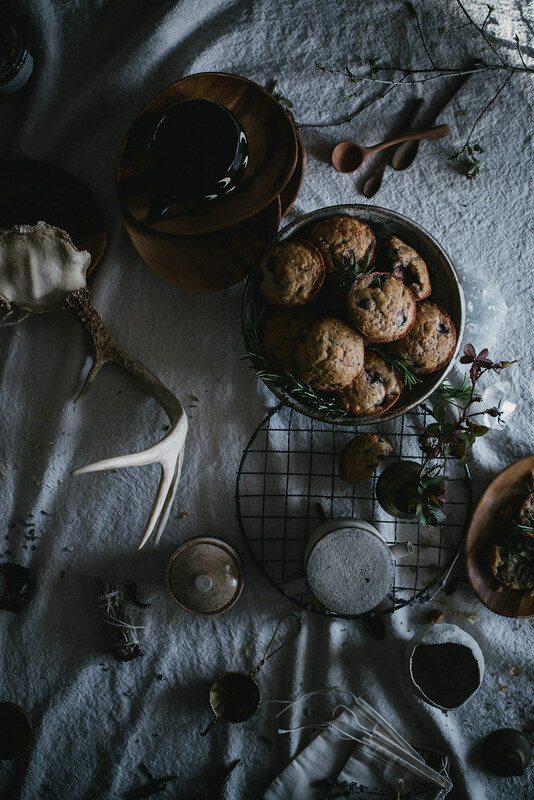 Sage would burn, the kettle clarion would sound, and homemade blends would steep in vessels of ceramic and glass while humble muffins baked in the oven. 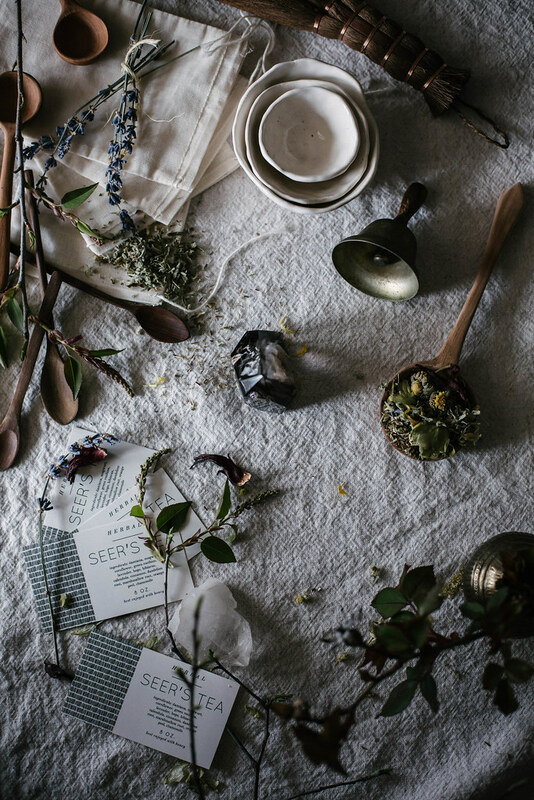 The table would be as it is—strewn with herbs, clippings of budding spring and crystals—smoky quartz and apophyllite, and no doubt my bag of runes would make their way to the table as we sipped lightly honeyed tea out of handmade cups. The simply sacred. 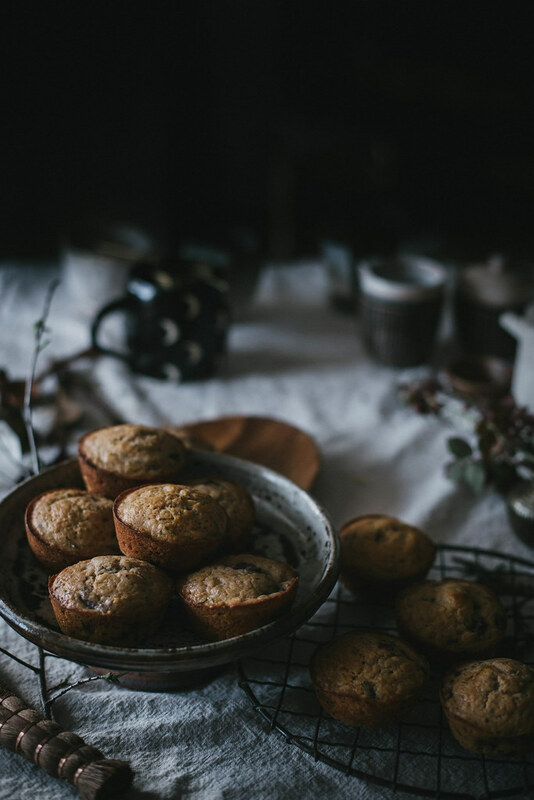 The muffins would be eaten decidedly hot, fresh out of the oven. My new oven. My gas oven. Yes, these little rosemary roasted strawberry & buttermilk muffins were the maiden voyage of my new range. You’d think I’d roast a pheasant or something. Nah. Muffins. 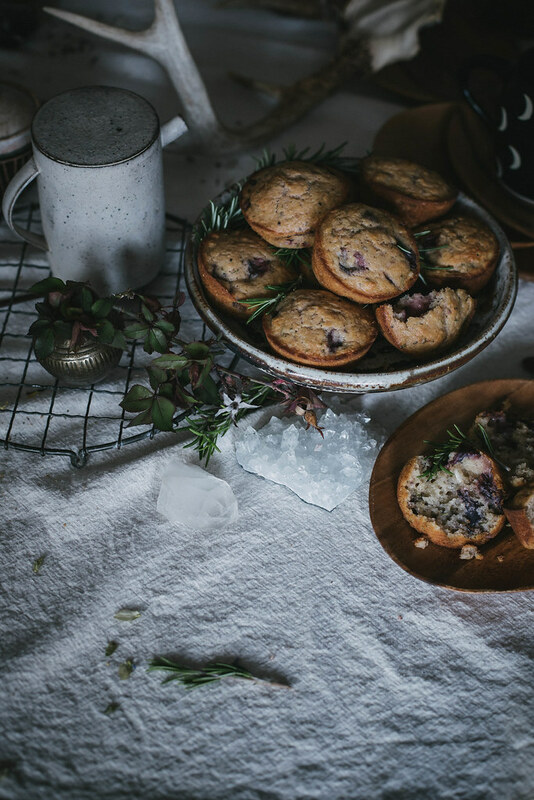 Wonderfully moist muffins spiked with rosemary and tart, jammy roasted strawberries & vanilla bean to go with my flowering tea. I actually didn’t have a stove for almost three full months until today when it was finally up and running 100% after a few minor adjustments, and during the dark, ovenless days I took comfort in herbs and their folklore. I’d boil water in the microwave that hulked in my dining room floor and brew tea for friends when they came round or for myself when I’d meditate in front of the fire. We’d sit in the floor and drink. My life was chaos. But I had my herbs. I’m sure whenever anyone renovates anything it’s chaos. Especially when a cook renovates their kitchen. But I don’t bounce back from chaos well—it creeps into my head with strange tentacles. I get disoriented, listless. There seems to be no wall between my internal reality & external, mess in either breeds mess in the other. So, I took to mapping my friends in the stars, reading the synchronicity around me, and making tables of the properties of herbs, both mystical and medicinal. Trust me when I say the damiana & mugwort in this tea are key. The house fell down around my head over the past three months; the oven, my compass, was missing. No kettle for the morning, no frying egg. No late night biscuits. It was like being so far under water you don’t know which way is up and down. It may sounds like I’m being facetious; I’m not. Cooking is something that has always been a coping mechanism for me. It’s always there for me, even when nothing else is. Cooking isn’t fraught with self loathing & doubt. Cooking is safe. I’m good at it. So I like it. It’s that simple really. Without it, I’m aimless. Things just aren’t the same. I think I lived off of bananas, bread, and candy. It was ugly. But I took respite in blending. It calmed me. 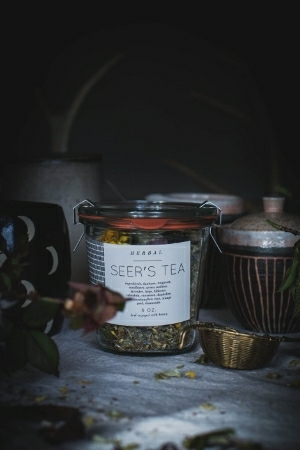 My “Seer’s Blend” is for relaxing, for anti-anxiety, for sleep. It’s also for opening the mind, for invoking a multi-dimensional consciousness. For tuning your third eye to the synchronicity. To help you read the poetry of events, signs, and symbols around you. If you wish. Or it can just be for sipping while relaxing with a strawberry muffin. Astral travel is optional. A reminder that you can make your own labels or find my design (as well as pretty much any other printable you can imagine from gift tags to business cards) on Makr, and they are generously offering a discount for you guys—a free credit and 20% off a print order. Register with the code LOCMILKFAN & enter the same code at checkout. Download the app here if you’re interested! 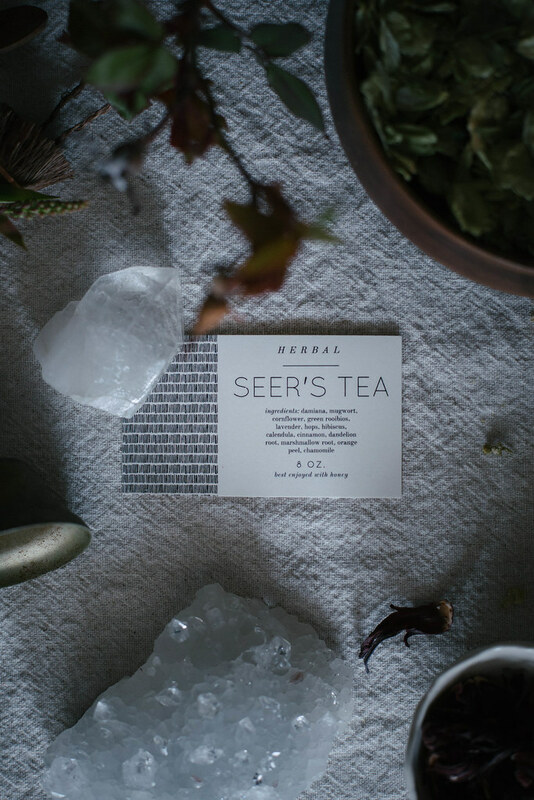 This is a slightly pared down version of my Seer's Tea blend (which also includes cinnamon chips, cornflowers, dandelion root, & marshmallow root, if you're interested.) It has a unique flavor, all at once earthy, floral, and slightly citrusy, and I find it's best enjoyed with a whisper of good honey. 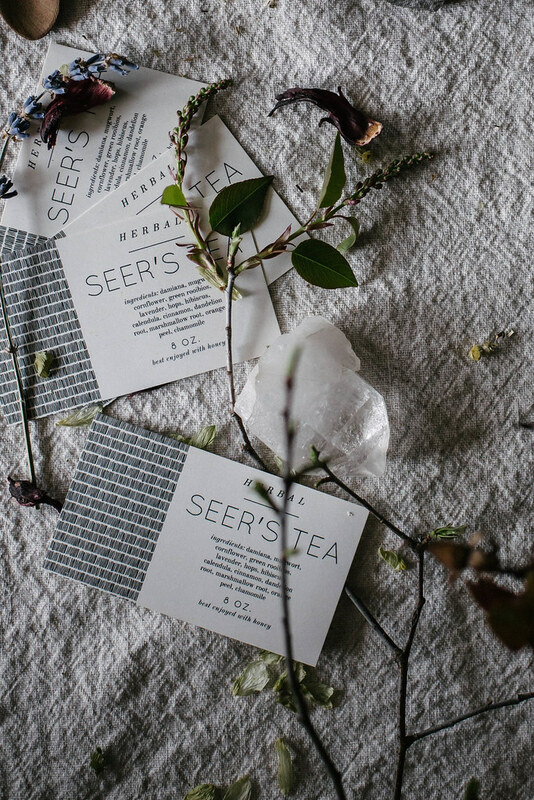 I use the phrase "seer's tea" to denote any tea geared at calming the conscious mind & awakening the intuitive sense. 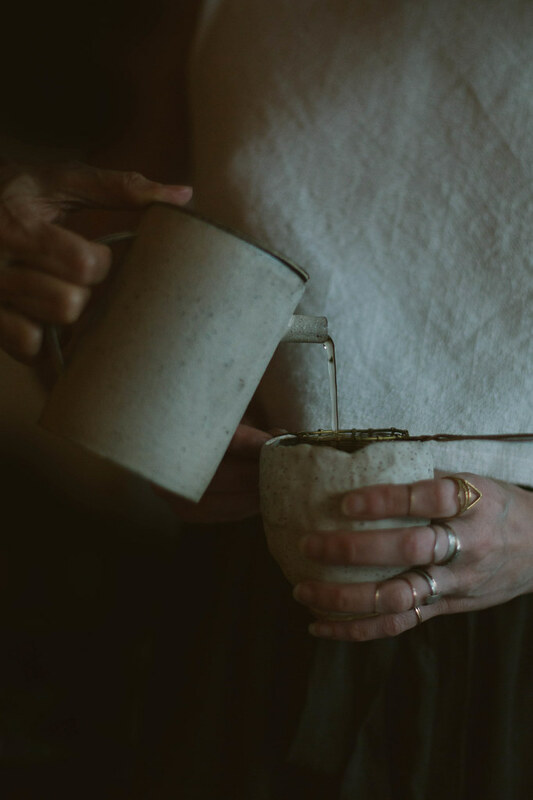 This is a great tea for sleep, anti-anxiety, and for scrying & divination. If you're into that. All ingredients should be in their dried form. Mix in a bowl thoroughly. Package in jars or bags. To brew, pour hot water (just under a boil but not boiling), over 1 tablespoon of the blend per 8 oz cup. Steep at 5 minutes, longer if you'd like it stronger. Best enjoyed with a bit of honey. 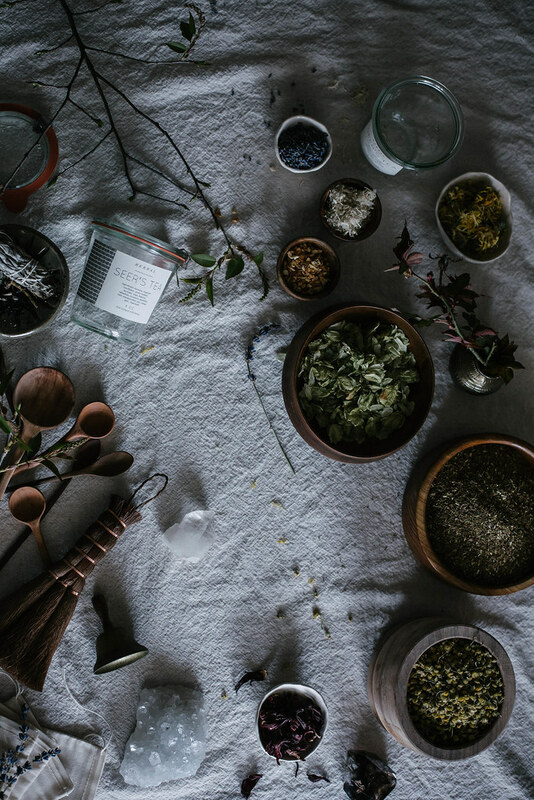 Dried herbs & teas can be purchased either online or often at your local health food or natural or wellness store. 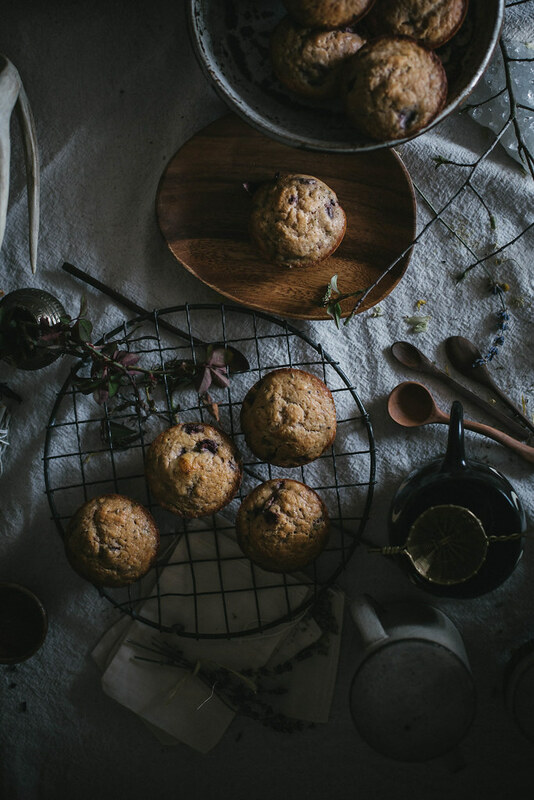 These muffins are painfully simple, an excellent addition to a cup of tea, and a great way to welcome the berry of spring as it just starts to make its appearance. The addition of fresh herbs and a hint of vanilla make these muffins special, and pro tip: the same batter makes killer pancakes too! Just halve the butter. Heat oven to 450°F. 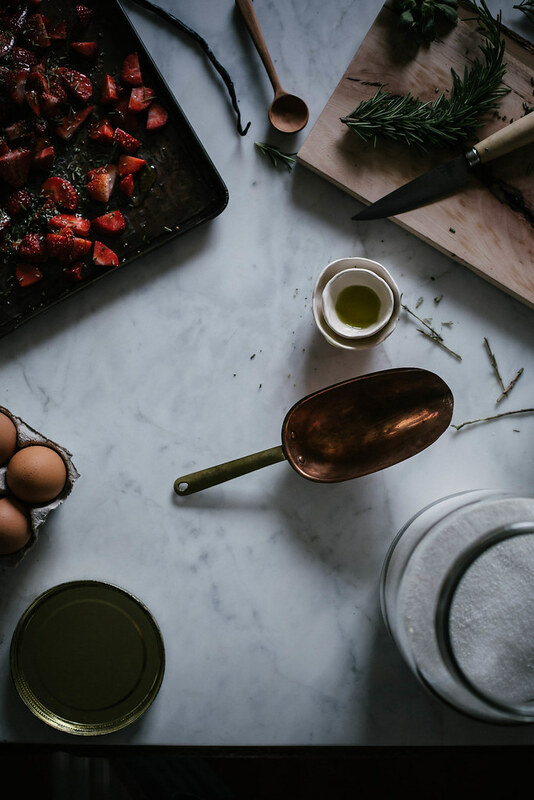 On a sheet tray, toss berries with the oil, honey, salt & pepper, and rosemary. Roast for about 15-20 minutes or until thick & jammy, being careful to not let juices burn. Put in a small bowl and allow to cool (I pop mine in the freezer for a few minutes to expedite this process). Reduce oven temp to 350°F. Meanwhile, while the berries are roasting, combine the sugar with the vanilla bean seeds (if using) with your fingers, breaking up the clumps and dispersing evenly. 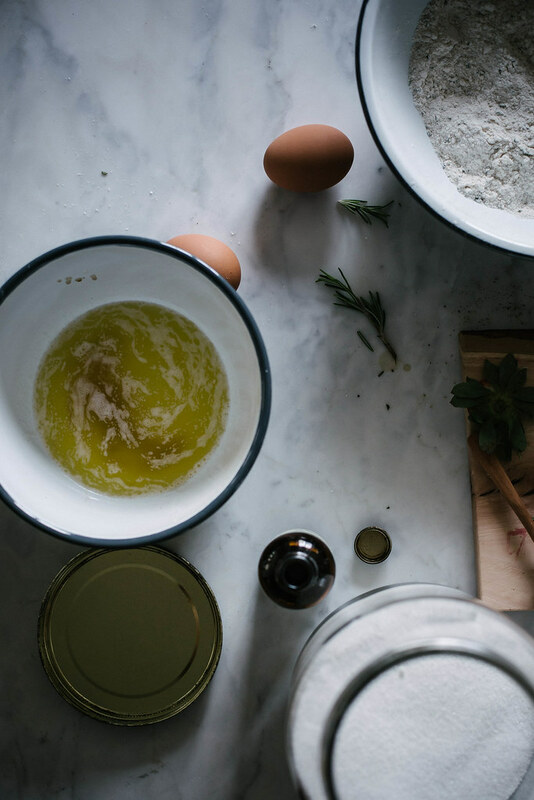 In a large bowl combine the flour, vanilla sugar, baking powder, salt, and rosemary. Stir with a whisk to combine well. In a separate bowl whisk your eggs lightly with a fork, just to make them homogenous. Add your buttermilk, butter, vanilla extract, and the roasted strawberries along with their jammy juices. Stir to combine thoroughly. Add the wet ingredients to the dry, and stir to just combine so that no dry bits remain. Don't worry about lumps, and don't over stir. You want your muffins to be tender! Lightly grease a muffin tin and fill the cups almost to the top but not quite. I used a 1/3 cup measure for my tin. This was a sponsored post, and I was compensated for my participation. All opinions, stories, and ramblings are, as per usual, my own. Seriously, this app is freaking awesome. 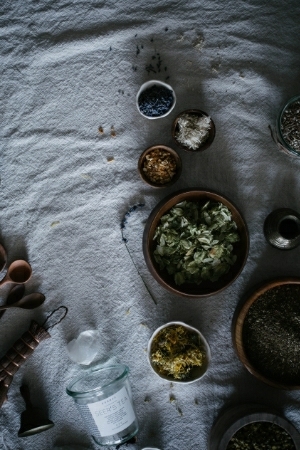 Experimenting with different herbs (especially isolating them and really becoming familiar with what each has to offer) has been a special adventure for me this year. Love that you collect them (and give them away, what wonderful gifts!) and especially love these labels! Also, YAY for having your oven back!!!! I can’t think of a better baked good to christen it. Finally, you should know I’m like a little kid on Christmas Day whenever I see a new post of yours — so much aesthetic inspiration at my fingertips! Pinterest, watch out. Thank you for this, Beth! Can I substitute creme fraiche for the buttermilk as I have a lot of it right now? Any changes in the recipe if I do this? You could definitely put creme fraiche in these, but I’d use liquid in addition to it because it’s not going to be quite as moist as the buttermilk. If you have milk I’d dilute the creme fraiche with that or even a little water. What a wonderful ode to herbs. 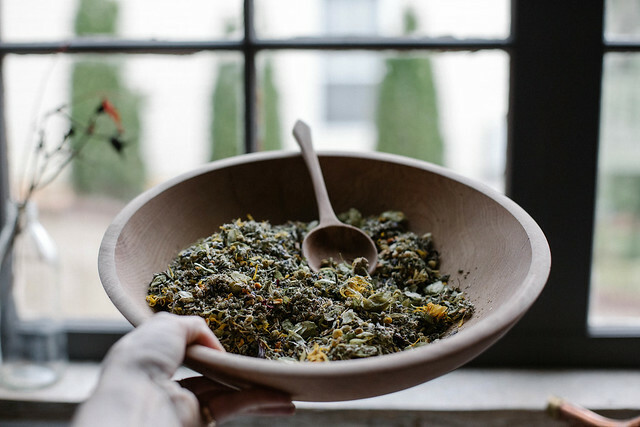 I was amazed by all the herbs you have sitting on your pantry shelves – oh how I would love to see them all! 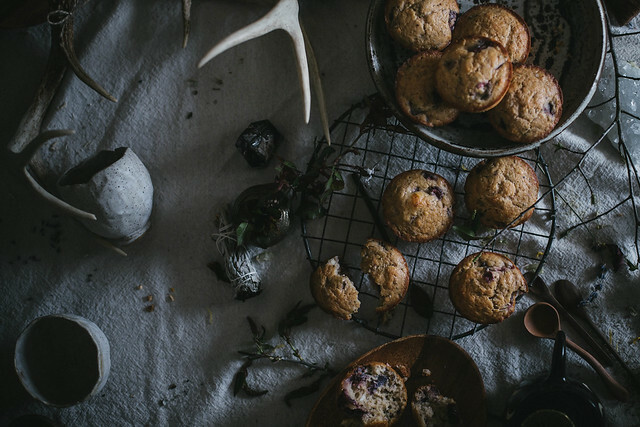 The strawberry buttermilk muffins sound amazing. I’ll make them as soon as strawberries are in season (I bought some from Spain the other day and they tasted of absolutely nothing…). Congrats for finally getting an oven! It’s a huge deal, really. Hope you get the kitchen of your dreams. I am crushing on your spoons so freaking hard. Also, these muffins look perfect! i have been taking advantage of the summer fruit & veges in New Zealand by making a LOT of chutneys ; nd i love the idea of being able to make pretty labels for my jars using the makr app – thanks so much for the introduction! and thanks too for the tea recipe Beth, I am off to scour the internet for a source of all those ingredients so I can make some for myself. Just GORGEOUS. 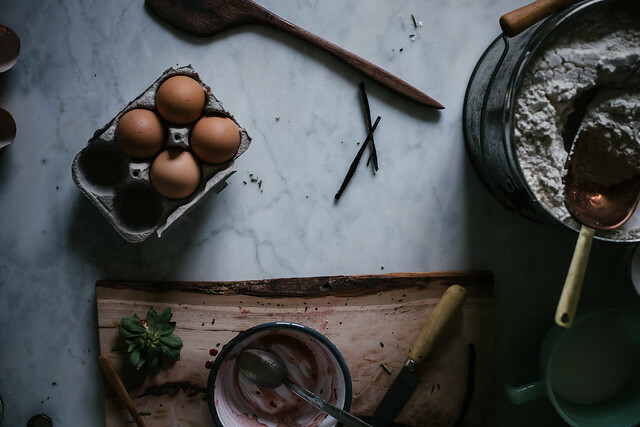 Love the photos + that recipe. Congratulations on the new gas stove! I can’t imagine 3 months without a stove, and you described the importance of cooking to you so well. I definitely feel aimless when I can’t cook for whatever reasons. Absolutely gorgeous post! It was a leeeeetle hellish. But now I’m back on my feet….and with 3 different oven modes to play with! I can’t wait to compare the same recipes baked in gas/conventional/convection…science! I don’t currently sell them due to a general lack of time. But if I ever do, I’ll certainly let you know! When it comes to tea and tea parties, I don’t really believe there’s a proper way to go about it. But if there were, yours’ sounds like the kind that I wouldn’t mind sitting down to. 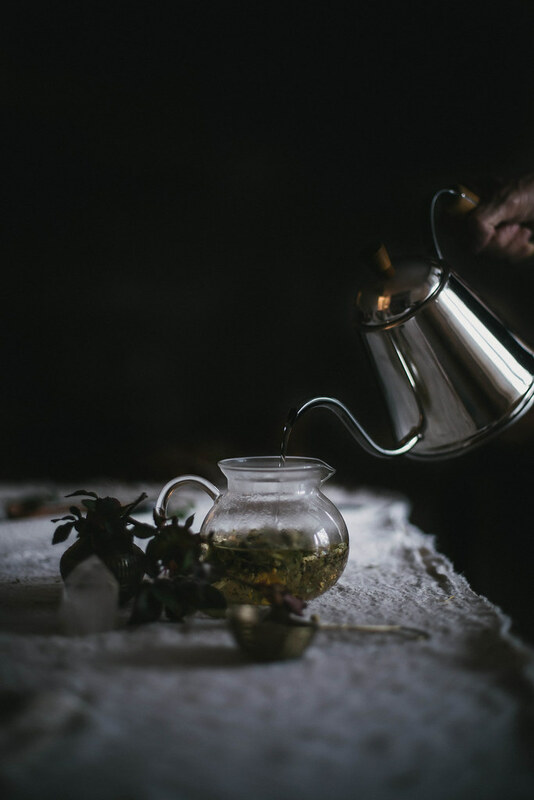 And if I couldn’t be at your tea party, then I might wish to be a fly or something on your wall, just so I could watch the whole endeavor go down- from blending, to baking, to photographing, to meditating in the heat of a renewed stove, a renewed soul. Thanks for sharing a glimpse of your world. You’ve got something really beautiful here, Beth. This is awesome as always, of course. 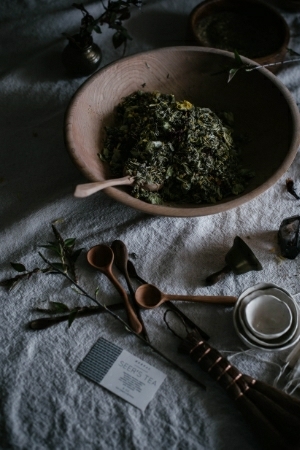 I have never used herbs much – glad I can use your blog as reference. 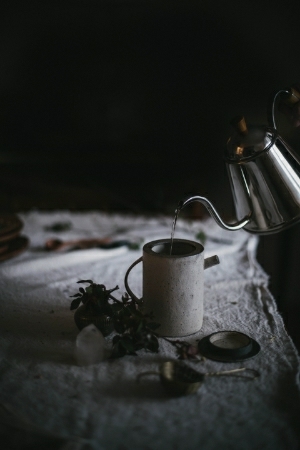 I have been meaning to get a glass teapot like that, and I am so trying this soon! I got a series of small Weck pots to store herbs in, too. I really want to use them more! So happy you got the oven back, so we can see more awesomeness from you. Happy sunday, miss! 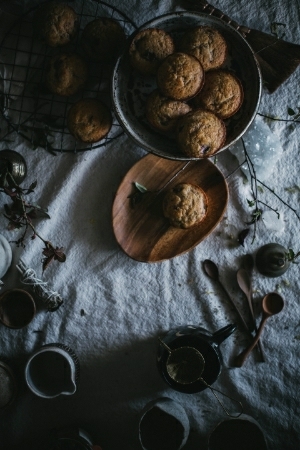 Love the surprising combination of rosemary and strawberries in the muffins. The smell coming from your new oven must have been heavenly! Just wonderful Beth, suffering a bit of anxiety due to making a huge life change. Literally, as I write this I am moving to TN, and how I found your site doing research, but that’s another story. Thank you for giving me tons of insight about so many shared interests. I enjoy your photos, recipes & the inspiring stories that go along with them. Best wishes & continued success. Now I’m going to have a big cup of that tea! Ha! Where in TN?? And welcome! Moving is a quite the loop to be thrown for. I guess the way I see it…anxiety is okay! And passes when everything’s settled again, however long that takes! Which for me is an inordinately long time due to perfectionist leanings that impede the “moving back in” process…even though for me it’s just one room! Beth, tried to send you an e-mail, but sending “arrows” keep rotating, not letting me know if it was sent successfully? No big deal, hope you got it, as sometimes the message will still go through. I apologize if it was sent multiple times! 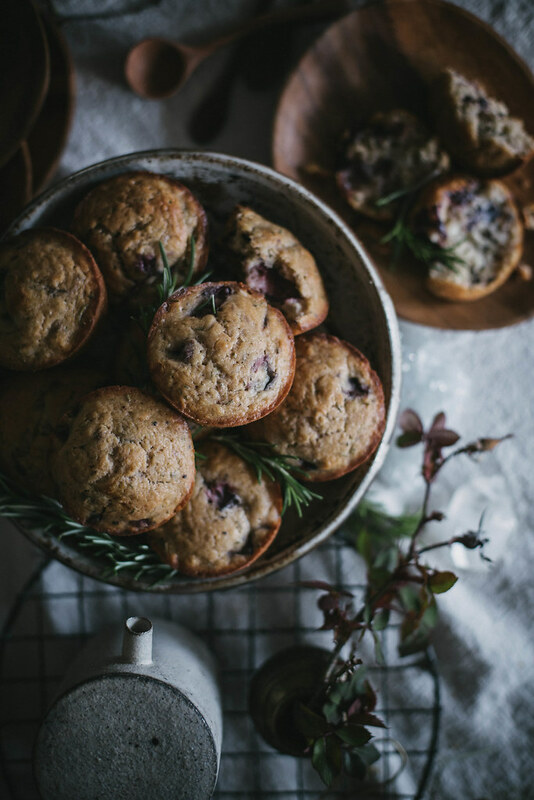 herbs & fruit are totally my baking M.O….always so good! Ahhh, I so identify with the “phantom kitchen” feeling when you’re without a stove or oven! Good work making it through the hard months without these bosom friends. These muffins are the perfect christening. Thank you for posting the weight as well as volume for the flour & buttermilk–I’m going to try these out, but with gluten-free flours and light coconut milk. It’s crazy. I’m still having to “remember” I can cook. So strange. I’d love to hear how your version of the muffins turn out! do you know of an app as cool as MAKR that is useable on windows8? Not at this time! I think it’s worth getting an iPad for! Beautiful! I am crushing on your new stove from Instagram, it is a beauty! Thank you! I’m still crushing on it too. It’s my baby! Can’t wait to share it on here! Saw this recipe and HAD to make some. Just made a gluten-free batch (so that I can share with family members). Had extra batter and made a thin “loaf” – thinking of slicing more strawberries and whipping up some cream to make an extra special strawberry shortcake. Thanks for sharing your recipe! 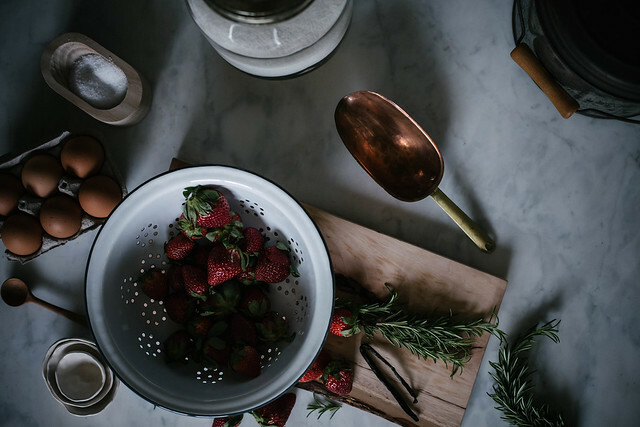 My mind is racing with ways to use the roasted strawberries. These images are so lovely! Happy to learn about Makr. I love that you can make such pretty labels. Can’t wait to give it a try. And the recipes too! I absolutely loved this piece. As usual, the pictures were beautiful, and you always seem to capture in a photograph the feeling of peacefulness cooking and the kitchen give to me. This time it was your words that spoke to me. I, too, was recently cut off from our kitchen when we had water damage, and it truly felt like my center of peace had been ripped out. It’s where I go when I’m feeling overwhelmed and need to think, and it was gone. Thanks for sharing, and I’m glad life can get back to normal for you. 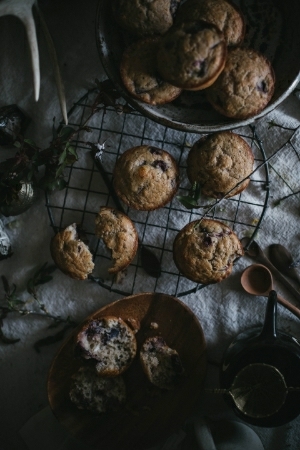 Just ate one of these muffins, hot and with butter…. SO GOOD! I’ve been fascinated with herbs for years. I long for early June just so I can pick the wild roses on my morning walks. They are dried and blended with all my favorite flowers (mint, lavender, chamomile and more) for my Sweet Dreams Tea. My jar is getting low, so early summer can’t get here so enough! 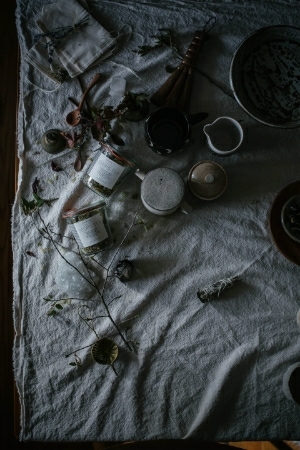 I wish everyone knew how wonderful herbs and flowers are for their own teas and things. I barely survived a fortnight without a kitchen earlier this year, let alone three whole months! You are a beacon of strength! It’s surprising how a single room can have such a link to one’s mental wellbeing and sense of balance, isn’t it? I’m glad that you’re able to get back to normal now. Also, your muffins look delicious. Guess what I’ll be making for breakfast tomorrow morning! about to bake these 🙂 is it 450f for muffins too? that seems a little warmer than the usual muffin baking temperature! Ah! No 350 for muffins….will fix that! 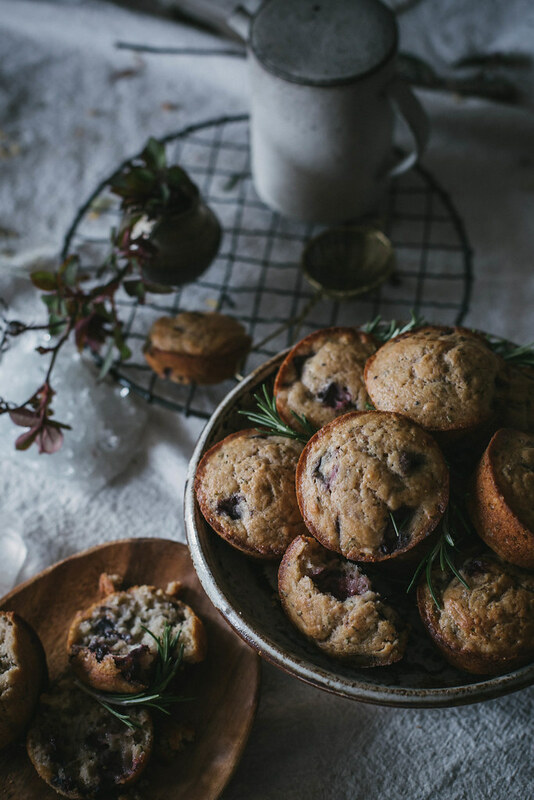 I just tried your rosemary & roasted strawberry buttermilk muffins recipe for a nice Easter morning brunch. Wonderful recipe, love the balance of sweet and savory. Your recipes and photos truly inspire. Thanks for sharing! Delicious looking muffins! Great photos! This recipe was great! I made 1/2 the batter into muffins and the other half into pancakes (as suggested). Amazing! Both were very good. 🙂 Thanks for the recipe!